Governor Hindmarsh Hotel, Sat 9 Dec.
Liverpool’s post-progressive demigods, Anathema, are currently touring their latest album The Optimist and graced The Gov stage in the most jovial of spirits, as antithetical as their namesake may suggest. Tonight’s line up have been working together since 2001: Vincent Cavanagh on guitars, keyboards and lead vocals, his twin brother Jaime Cavanagh on bass and their older brother Daniel Cavanagh on lead guitar, keyboards and vocals, John Douglas on drums and Lee Douglas on lead and backing vocals. In true prog-rock fashion (or mere coincidence) Vincent first appeared on the stage by himself at exactly 21:12 (Rush) to kick off the show with San Francisco from the new album. The bed of the track was being played through a laptop through live performance software. He slowly released a low-pass filter on the percussive synth elements of the piece (gradually increasing the treble, expanding the sound), and played the melody live on a synth. 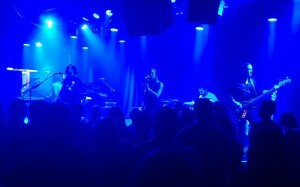 The rest of the band moved onstage towards the end of the piece to perform Can’t Let Go, Endless Ways and The Optimist in one big medley showcasing their latest release with startling adroitness; a fantastic introduction. Anathema’s versatile crew offers a range of aural textures and timbres instrumentally and vocally. 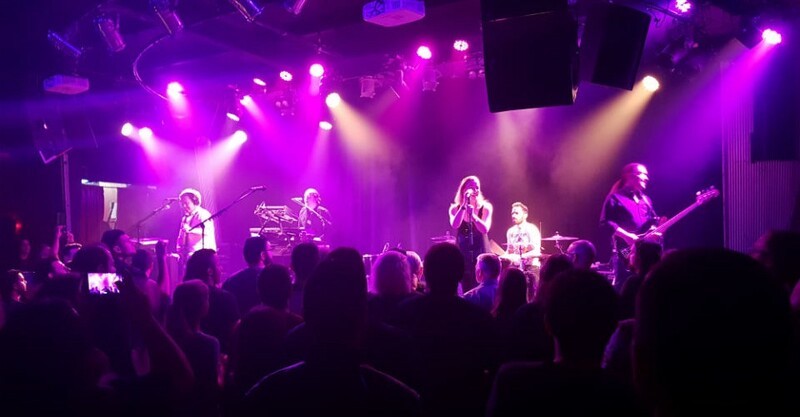 The introduction of synth and production techniques into their sound demonstrates the group’s savoir faire to achieve both electronic and traditional rock sounds. They have become masterful at atmospheric vamps, enveloping the room with intransigent waves of melody and emotion. That being said, their on-stage sound is actually pretty quiet. Despite having two Marshall JCM 900 heads on the stage there were no speaker boxes to be seen. They were using speaker-cabinet simulation equipment to run the guitars direct through the front of house, which leaves the drums as the only on stage sound with little to no bleed in sound from the other instruments. A great live mix! 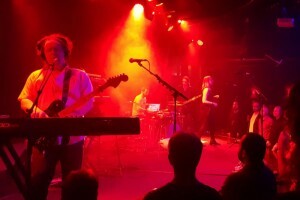 The set also included material from other albums released since 2001, such as Pressure and Barriers from A Fine Day To Exit, Closer from Natural Disaster (sporting the vocoder vocal effect), Universal from We’re Here Because We’re Here and in the encore, the title track from Distant Satellites and Untouchable, parts one and two from the Weather Systems album. Not only are Anathema a fine band, they also have a wicked sense of humour. They engage with the audience marvellously well demonstrating their love for Australia through facetious banter and imitating the Aussies’ light-hearted love for profane language. Vincent Cavanagh declares Adelaide to be a gorgeous city and says they were charmed by the reception after travelling ten thousand miles. No doubt, they’ll be back. A fine performance from a fine band.